A review of “We Make the State”: Performance, Politick, and Respect in Urban Haiti, by Chelsey Kivland. The former Haitian dictator Jean-Claude “Baby Doc” Duvalier recently died in 4 October 2014 at the age of sixty-two, thus escaping an ongoing investigation into human rights crimes. Jean-Claude came to power at the age of eighteen after his father François Duvalier, who had governed since 1957, died in 1971. The successive rule of father and son constitutes what has been known as the Duvalier dictatorship that not only brutally, corruptly, and undemocratically governed Haiti, but remarkably lasted in power for almost three decades. When a popular revolt in 1986 finally forced the Duvalier regime out of power, Duvalier and many high-level state officials quickly fled the country and lived in exile without ever being officially held accountable. The unpopular legacies of the regime have followed Jean-Claude to his grave. Many Haitians have expressed disappointment that justice did not catch up with the former dictator before his death for past transgressions and the violent legacies he and his father helped create, while others toasted and cheered to “one less dictator on the planet” (Carine Fabius, “One Less Dictators on the Planet,” Huffington Post, December 7, 2014). In the post-Duvalier era, still other Haitians possess more complicated views which verge on nostalgia for the regime, as Chelsey Louise Kivland reveals in her dissertation entitled “‘We Make The State’: Performance, Politick, and Respect in Urban Haiti.” Kivland’s dissertation does not expansively look at the Duvalier regime or its legacies but rather analyzes popular politics in the democratic transition period up until the 2010 earthquake (which Kivland actually experienced). Kivland’s dissertation is an insightful ethnography on masculine street politics in Bel Air, one of the most politically and economically marginalized zones in the capital of Port-au-Prince. She argues that through membership in state or NGO-sponsored grassroots organizations, urban men act out public roles to symbolically enact state functions as a way to assert themselves as moral authorities in their community, to imagine models of governance, and to make claims on the state. Kivland’s most thought-provoking point is that these urban masculine political performances of the state should be construed as popular desires for a stronger and an accountable Haitian government in the midst of predominant neoliberal polices imposed by foreign governments and institutions. After the fall of the Duvalier regime and during the democratic transition, Haitians have witnessed the increasing influence of foreign institutions that have led to the privatization and liberalization of the Haitian economy, making a country that once grew and consumed most of its own food now greatly dependent on U.S. food imports. Political violence has persisted. For example, gun battles between UN forces that go by the acronym MINUSTAH (United Nations Stabilizing Mission in Haiti) and local gangs make Bel Air a dangerous zone. In effect, the Haiti that materialized in the post-Duvalier era has been increasingly destitute and still politically violent. Kivland interviews urban Haitians who describe their anxiety that the Haitian state has gradually lost a monopoly over power in the democratic era, in which power has been shared among and sometimes superseded by the United States government, the United Nations, and other multinational institutions. The division of power, Haitians intimate to Kivland, has left no central source to which Haitians can make claims. Instead, multiple sources of political power create competing visions of development that manifest in local struggles among grassroots organizations, comprising poor urban men in Bel Air. Here, Kivland confronts the legacies of the Duvalier regime that in some ways are embedded in popular disappointment with the democratic transition that followed the fall of the Duvalier regime. The confusion of who’s really in charge has produced nostalgic rumblings throughout Haiti that Kivland captures in one interview, “Everyone says Duvalier was bad, but he was a big ‘boss’ or ‘bully’ (towo chèf). He could make order” (p. 35). Kivland shows us that positive memories of the Duvalier era are linked to widespread discontent with international intervention in Haiti, which prevents Haitians from collectively achieving their political goals. In Chapter 2, Kivland focuses on discourses of “statelessness” and provides ethnographic examples that illuminate and support her general argument. We are introduced to a cast of urban men who aspire to live a life of respè (respect) without dezòd (disorder) and misè (misery tied to extreme poverty). To achieve respè, urban men join or create local groups to mobilize efforts for community sanitation, access to clean water, security, extracurricular activities, and street music. In many ways, these groups perform state functions to step in where the state is absent—but also do so to achieve approval of the community as moral authorities. In order for these groups to operate regularly, they seek out resources from the multiple powers that make organizational activities fraught with suspicion and contention in a Haiti where resources are scarce. Kivland gives us the example of what happened to Frantzy, a leader of a youth group, when he was funded through UNDP and the Ministry of Public Health to organize a street-sweeping operation in Bel Air. The day the operation was to take place, two men of another organization to which Frantzy also belonged attacked him. The men suspected Frantzy of misappropriating organizational funds and wanted to break away to form their own group. After the attack, the street sweeping operation was subsequently abandoned. Frantzy complained to Kivland, “The state is supposed (sipoze) to do this, but the state needs to organize this. It doesn’t make sense. I organize and now I have no security” (p. 64). Kivland also reveals that urban male organizers like Frantzy are involved with local criminal elements as a form of protection from rival organizations. Kivland explains that Frantzy reluctantly relies on crime bosses who only tarnish his reputation as a community organizer, thus preferring the support of a present and strong Haitian state “that embodies not only might but also the moral authority and could thereby reinforce his project of civic engagement”(pp. 68-69). Chapter 3 focuses on Bel Air’s rara street bands that are carnivalesque, but also steeped in the traditions of the African-derived Haitian religion of Vodou. Kivland pays special attention to a band called Laloz’s and its leader named Woody. Kivland analyzes Laloz’s songs, religious rituals, and structural organization that reflects localized aspirations for accountable governance while navigating between the criminal urban world “and respectful leadership that have equally marked Haiti’s democratic transition” (p. 81). Woody and Laloz are reluctantly affiliated with criminal elements for protection but try to keep their criminal association a secret. In public, the band members strive to present themselves as symbolic officials in charge of local carnival and religious activities. Woody is the “president” of Laloz and heads the band’s committee, whose members must obtain a state-issued certificate acknowledging a clean record (p. 112). Kivland describes how the band also sought official registration by paying costly state fees. But Woody relied on a “gift” from criminal sorts to begin the process. Kivland quotes Woody’s justification, which only captures the irony of urban street politics, “If we become something ‘legal,’ they’ll look at us like people. Not like bandits, it’s people were are, not animals” (p. 117). In Chapter 4, Kivland continues her examination of rara musical lyrics. She argues that their popular songs usually call for a stronger national state and criticize neoliberal policies imposed by intervening foreign institutions. Using popular rara songs recorded during her ethnographic study, Kivland remarkably discovers what comes close to a popular consensus on Haitian politics. After listening to a rara band play a song that supplicated for an anonymous “mister” to rescue Haitians from misè, Kivland asked one of her interviewees, Anton, who was this “mister”? Anton answered by repeating an old Haitian adage: “After God, is the State” (p. 140). Kivland is not the first anthropologist to study Haitian rara (see Elizabeth McAlister, Vodou, Power, and Performance in Haiti. Berkeley: University of California Press, 2002). But she unconventionally demonstrates that popular culture does not only resist power but is simultaneously bound up in state formation, whereas the literature on Haiti contains the prevailing view that Haitians have largely been excluded from politics and state making. Aside from Chapter 5, which delves into the masculine performance of leisure and its relationship with ideology and state power, Kivland’s thesis regarding urban performances of statehood as a way to articulate a desirable model for a strong but accountable government is greatly supported by ethnographic fieldwork. Furthermore, Kivland’s work joins the growing field of anthropology on the urban poor in Haiti, whereas previous ethnographic studies have been almost entirely centered on peasant life in the countryside. Last, this dissertation is about localized ideology emanating from the ground as Haiti undergoes democratic transition. What Kivland’s interviewees seem to be consistently saying is that democracy cannot be achieved without a state that can represent the “whole.” If so, Haitians are describing a society governed by what has long been viewed as the modern state. 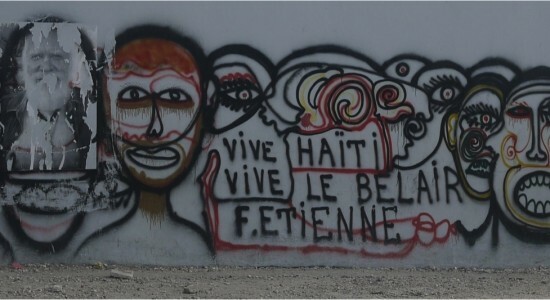 Throughout this dissertation Haitians express to Kivland the idea that the government is the only entity that can uphold the collective morals of society and mobilize the nation towards a better future that is free from hunger, poverty, insecurity, and international interloping—misè. Frantzy’s explanation to Kivland as to why Haiti needs a strong state might as well have been ripped out of Hegel’s Philosophy of History: “You ask me why we only look to the state? Well it’s because that is the only thing that can regroup us all, and give us a response [to our demands]. But, here, there is no state” (p. 60). Kivland’s ethnography is profoundly important because it provides the popular ideological framework from which widespread nostalgia emerges for an authoritarian past like the Duvalier regime. Not because Haitians yearn for the days of state violence; instead, they are commenting on the new (perhaps “post-modern”) government of “global assemblages” that fail to represent the collective interests of the nation. University of Chicago. 2012. 235 pp. Primary Advisor: Jean Comaroff.